Lavera Vegan Firming Eye Contour Care slows skin sagging by improving the firmness of the skin in this fine area of ​​the eye contour. His secret? Its natural formula Green Lift which has the effect of boosting the collagen production of the skin and stimulate its cell renewal. Natural lifting effect guaranteed! The skin becomes smoother and toned over the days. Composed of hyaluronic acid with regenerating properties and karanja vegetable oil, this Vegan Care deeply hydrates and visibly reduces wrinkles and fine lines around the eye. 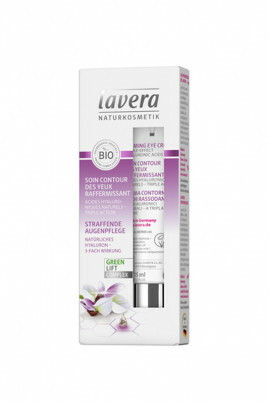 Thanks to its light texture and applicator specially designed for this sensitive area, the Lavera Vegan Firming Eye Contour Care provides an immediate sensation of freshness. Morning and evening, apply this cream on the eye contour. Make penetrate by massaging gently with the applicator. For a 100% natural face routine for your demanding skin, we recommend combining this eye contour with Vegan Firming Day Care and Lavera Firming Night Cream! You will get over uses a firm and smooth skin! A radiant look of youth with natural ingredients !